In 1711 the silversmith of Charles of Bourbon Court, Lorenzo Cavaliere, was commissioned by Mons. 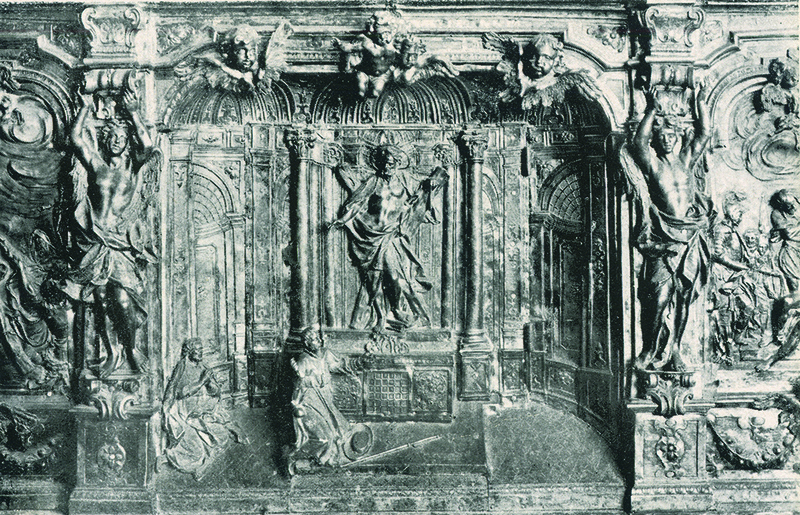 Bologna to create a frontal to the altar in the crypt of the Cathedral of Amalfi. On the frontal, already rehashed in 1726, were added some heads of angels bearing the consular stamp of Sebastiano Avitabile and the initialling of the silversmith were added. In 1826 he was removed from the crypt to decorate the high altar of the Duomo. The addition of external panels with the insignia of Bishop Miccù, made by silversmith Luigi Forte, it was necessary to increase the size and adapt it to the new location. The scenes are set within a bas-relief that briefly depict the crypt: in the central compartment is the altar, where once (before the theft) were in relief Saint Andrew and two pilgrims in prayer. On the median sectors there are still scenes of the martyrdom of the Saint: the Scourging and Crucifixion. The elegant figures of angels as telamons, who were present on the pilasters of subdivision of the frames, were also stolen. Refined architectural effects, the exuberance of forms and the decorative display make it one of the most significant works by the Baroque Neapolitan goldsmith.